Warning: these pages are content-rich (a lot of text, and some graphics-size is currently 100kb). Average size is 30k-50k but some are as large as 200k, so they may take a while to load. Please be patient! April 21, 2015. An audience member recording of John Mayall's Bluesbreakers - Live In '67 has just been released. While audiophiles might not appreciate the primitive sound, fans of John Mayall, Peter Green, John McVie and Mick fleetwood will be impressed by the quality of their playing. Louder Sound article abut the Live 1967 recordings featuring the foursome of John Mayall, Peter Green, John McVie, and Mick Fleetwood. November 1, 2010. John Mayall in concert at Leicester Square Theatre, London will be streamed on the internet. You will need to pay for your ticket to watch this event. It looks like you will be able to watch the instant replay if you miss the initial web stream. May 4, 2010. I finally picked up my copy of John Mayall - The Private Collection. This two CD set includes various live songs from between 1972 to 1982. This period has some of his more jazzier music as well as the Bluesbreakers reunion. December 18, 2008. I finally picked up my copy of John Mayall and the Bluesbreakers - Live at the BBC. This contains a nice selection of live songs from 1965 - 1967 and a couple from 1975. This is a good addation to any John Mayall collection as there are tracks not found on any other releases, as well as live versions from various of the early line ups. August 31, 2008. You can now listen to streaming free music from this band as well as others at Wolfgangs Vault. January 29, 2007. Essentially John Mayall a specially priced 5CD box set of recent John Mayall recordings, also includes a CD of live tracks recorded from 1966 thorugh 1994. December 19, 2006. Blues Breakers With Eric Clapton has been released as a 2 CD set. The second CD has some of the 45s as well as some of the BBC radio performances that also featured Eric Clapton. April 10, 2004. 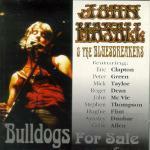 Some of the original Bluesbreakers CD are being reissued with bonus tracks. I just picked up A Hard Road 2 CD set with 22 bonus tracks. This looks like most the studio tracks that Peter Green recorded with John Mayall. It includes all the 45s, EPs and otherwise obscure studio recordings. May 29, 2001. Yahoo! 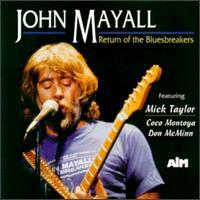 News John Mayall Gathers Bluesbreaker Alumni. News story on new John Mayall album on which he reunites with many of the old players, and manages to connect up with people he hasn't played with before. October 28, 2000. Once again, Marc Skobac has helped out this site (and music fans) by forwarding his sessionography of the Bluesbreakers. His work is greatly appreciated. Thank you Marc. October 28, 2000. Once again, DeltaNick has helped out this site (and music fans) by forwarding copies of John Mayall radio programme logs from the BBC archives. Thank you DeltaNick. While I don't have any details yet, I have noticed that there are a couple of John Mayall live CDs from the period just after Mick Taylor left the band. May 2, 1999. 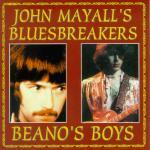 I just received the "Beano's Boys" CD which is a compilation of BBC live performances and the 1968 Bremen, Germany show. October 27, 1998 I just received additional information (correct band member listing, and partial song listing) on the June 27, 1970 Bath Festival show. Starting in July ? ?, 1998 Making Time British Beat Groups of the 1960s will post a review I wrote for the Looking Back CD, and have a link to my pages. Thanks. John Mayall's Bluesbreakers started out in the late 1950s in England. This was/is a band that used American style blues as a starting basis for their sound. The sound has changed from album to album. And while at one point John Mayall was playing a fairly jazzy sound, he has eventually come back to the blues. One of the interesting features of the Bluesbreakers, is that the personnel changed on a very regular basis, and many members have gone on to much well deserved fame and fotrune with other bands and as solo acts. John Mayall seems to have been very careful in keeping track everything that he ever recorded. Most every album has an exact recording date and location. And when crosschecked against the Peter Green book, they agree exactly. However, when cross checked against the Eric Clapton books they don't. But I have already found other inconsistancies with the Eric Clapton books on the Yardbirds stuff, so if I had any doubts, I used any source before the Eric Clapton books. I have not found any books covering the Mick Taylor years. I would appreciate hearing from anyone that has any additional information from that period. Until then, this will have to do. For deciding who was in which version of the band, I have gone with Peter Frame's Rock Family Trees. Most of the other books and records seem to agree with his research. His book is a *MUST* own for any fan of 1960's/1970's. Buy it! It is back in print again, and there is no telling how long that condition will last. LIVE SHOW: 1966 London, England (not necessarily from the same show). RECORDED AT "A HARD ROAD" SESSIONS BUT NOT RELEASED ON THAT LP. LIVE SHOW: 1967 London, England (not necessarily from the same show). 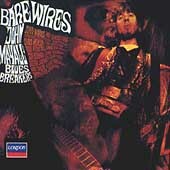 RECORDED AT "BARE WIRES" SESSIONS BUT NOT RELEASED. July ? ?, 1968 Colin Allen (drums) and Steve Thompson (bass) join. LIVE SHOW: September ? ?, 1968 ????????????????????? PERSONNEL: mid-January 1969 - short tour of Switzerland. LIVE TOUR: mid-January 1969 - short tour of Switzerland. LIVE TOUR: January 1982 - US West Coast Tour. LIVE TOUR: June 2, 1982 - June 20, 1982 US East Coast Tour. LIVE SHOW: June 17, 1982 - Wax Museum, Washington D.C.
LIVE TOUR: January 1984 US West Coast Tour. Published by Castle Communications. Copyright 1995. 229 pages. Published by Omnibus Press. Copyright 1986. 96 pages. Eric Clapton - The Complete Recording Sessions 1963 - 1992 by Marc Roberty. Published by St. Martins Press. Copyright 1993. 192 pages. Eric Clapton - The Eric Clapton Album Sessions by Marc Roberty. Published by Viking Studio Books. Copyright 1994. 224 pages. Published By Big O Publishing. Copyright 1976. 95 pages. Softback. Published By Miller Freeman Books. Copyright 1999. 192 pages. Paperback. Published By Wombeat Publishing. Copyright 1998. 224 pages. Paperback. Published By BBC Books. Copyright 1993. 320 pages. Paperback. Published by Balafon Books. Copy right 2000. 192 pages. Paperback. Published by Viking Studio Books. Copyright 1994. 224 pages. Hardback. Published by Omnibus Press. Copyright 1997. 176 pages. Softback (oversize). Published by Omnibus Press. Copyright 1997. 208 pages. Softback (oversize). Released January 1967. Liner notes don't make it clear, but it looks like this is a collection of session work that never made it onto any records. Session musicians include: John Mayall, Eric Clapton, Peter Green, Steve Anglo, John McVie, Aynsley Dunbar, Otis Spann, Champion Jack Dupree. A collection of tracks with various bands that Mick Taylor played in including John Mayall's Bluesbreakers, Alvin Lee Band, Bob Dylan, Alexis Korner & Jack Grunsky, Jack Bruce Band, Rolling Stones. (ad) Blues Breakers With Eric Clapton has been reissued as a 2 CD set. The bonus tracks included the various 45s and some of the BBC tracks. Nine original albums. Plus the following compilation albums. A compilation album of studio material. A compilation album of live performances. The original LP, plus most of the studio tracks recorded with Peter Green. A compilation album of studio performances. While this has *NO* recording date or location, it does list each musician on each track. A compilation album of studio performances. This compilation has the recording date (but not location), it does list each musician on each track. It also has a number of tracks that relatively rare. These are some of the many compilations that have since been issued. Return Of The Bluesbreakers contains performances by the 1982 reunion tour, as well as performances from his 1985 band. John Mayall also returns to play with performers he has worked with in the past. This 5CD box set includes 4 CDs of recent material as well as 1CD of older material. A collection of tracks live on the BBC between 1965 - 1967, and some Live tracks from Germany 1968. If band member listings are correct, I have tried to approximate the correct dates. Liner notes include which band members played on which tracks, but not recording dates. A collection of tracks live on the BBC between 1965 - 1967, and some Live tracks from Germany 1968. There are minimal liner notes, so I have tried to approximate the correct dates. Liner notes only list lead guitarists (I think some may be wrong). Rope Ladder To The Moon,a 1969 movie that featured Jack Bruce, John Mayall, .. and that I am totally unfamiliar with. Anybody have any info on this or any other file appearances? 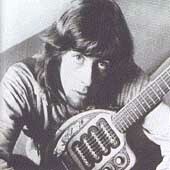 Do you have a John Mayall related site? Do you want a link from this page? E-Mail me! John Mayall.com, the official John Mayall web site. Mick Taylor, former Rolling Stone, Bluesbreaker, ... and currently solo performer. Mick Taylor "Time Waits For No One", info on the various bands he has been in (including John Mayall, Rolling Stones, ...). Roger Dean the guitarist (with John Mayll among others). John The Revelator has live recordings from 1967 of John Mayall's Bluesbreakers featuring Peter Green. You can list to samples on this site.